Eilat Club Inn Hotel is located on Coral Beach, away from the city center and stretches upon 7.5 acres of green areas with 2 stories complexes, away from the rumpus of everyday life yet close enough to the amusement center of Eilat. 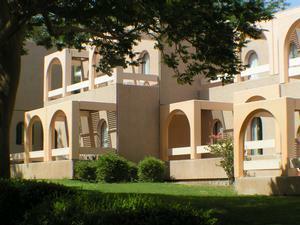 Eilat Club Inn Hotel allows his guests to choose whether to eat in a restaurant or prepare their own meal. Stores located at the midst of the resort grounds offering variety of fresh fruit and vegetables, variety of food products and prepared meals. The hotel serves a rich buffet breakfast. Eilat Club Inn Hotel offers swimming pools for adults and for children, surrounded by wide tanning surfaces, soccer fields, basketball court, Tennis court and Ping Pong tables. Stores located at the midst of the resort grounds offering variety of fresh fruit and vegetables, variety of food products and prepared meals. 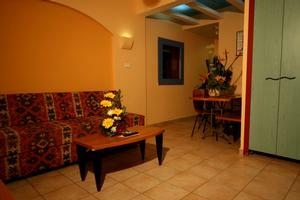 Eilat Club Inn Hotel's Villa includes: 2 bedrooms unit with a living room that can be converted into a children's room. Suitable for a family up to a couple with 4 children. Each Villa has 2 T.V's, a safe, dinning corner, balcony and an accessorized kitchenette including: a microwave, an electric kettle, a small fridge and a cutlery set. 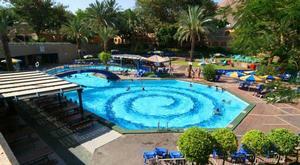 Eilat Club Inn Hotel is a resort located in a wadi over looking a breathtaking desert view. Eilat Club Inn Hotel is located on Coral Beach, 7 kilometers away from the city center and stretches upon 7.5 acres of green areas with two stories complexes, away from the rumpus of everyday life yet close enough to the amusement center of Eilat.